[Fresh herbs can be hard to come by, but not parsley, which is perhaps the most ubiquitous. In many restaurants, parsley functions more as a decoration than food but is often the most nutritious item on the plate. The herb is a rich source of vitamins, minerals, and antioxidants, and is a time-honored folk remedy. While parsley is one of the most popular cooking herbs in the world, it was considered a medicine before it was regarded as food. Parsley is still used to treat a variety of health problems but is best known for its influence on the bladder and kidneys. Germany’s agency for evaluating herbal medicine, Commission E, approves parsley leaf for flushing out the urinary tract. After cranberry juice, parsley juice is a top choice among herbalists for treating bladder infections. 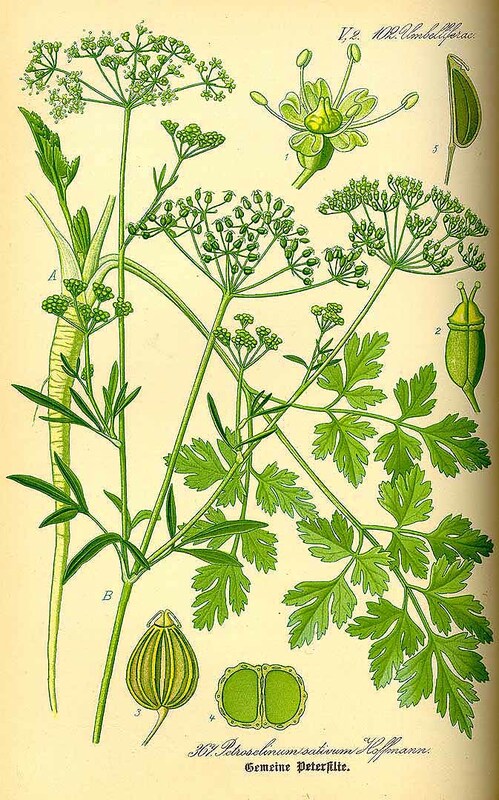 Parsley is closely related to celery. 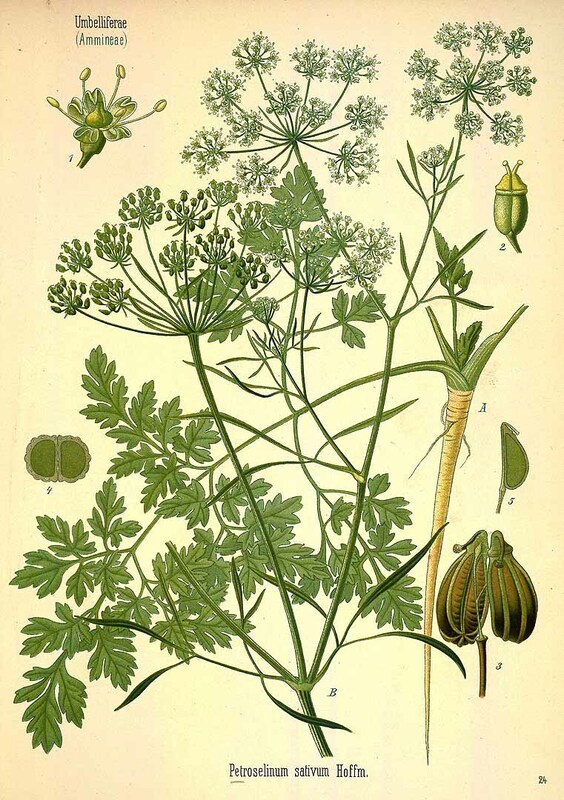 The Latin botanical name for parsley, Petroselinum, means “celery of the rocks.” This may be a reference to the rocky soil the plant prefers, or to its reputation for dissolving and preventing kidney stones. Another ancient use for parsley that survives today is to encourage menstruation. For women who endure an extended cycle, parsley is known to bring relief by bringing on a period. For this reason, pregnant women are discouraged from eating too much parsley. A few occasional sprigs are safe enough, but a strong tea or a glass of fresh parsley juice are ill-advised. At the end of pregnancy, parsley is traditionally given to women to make for an easier labor and delivery. Parsley is a good ally for older women concerned about osteoporosis. It is an exceptional source of several bone strengthening minerals, including calcium and magnesium. It is also a good source of protein, iron, folic acid, and vitamins A and C. Parsley is particularly rich in vitamin K—a nutrient necessary for blood clotting. Parsley is good for men, too. It is rich in zinc, which improves prostate health and helps to decrease any inflammation. 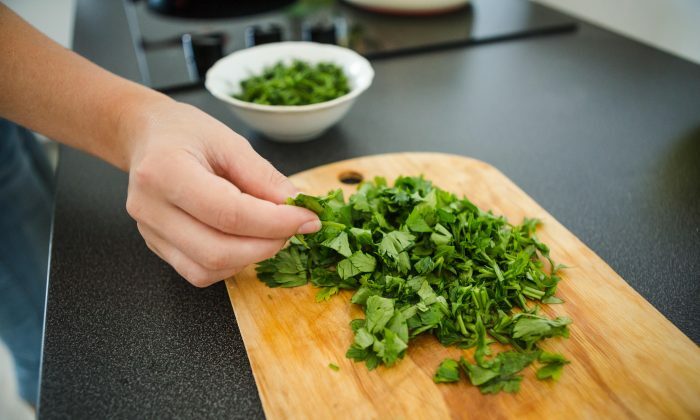 Parsley’s deep-green color reveals an herb that is rich in chlorophyll, which means it helps to detoxify the liver, cool inflammation, prevent free radical damage, and protect the body from carcinogens. It’s also one of the few fresh herbs you can find at the grocery store year-round. You can choose between flat-leaf (also known as Italian parsley) and curly-leaf varieties. Both have a similar taste, but flat-leaf has by far the strongest flavor. Another variety of parsley that is making more appearances at American grocery stores these days is cultivated for its white, carrot-like root. Throughout Europe, this variety, called Hamburg or turnip-rooted parsley, is a common vegetable that is eaten cooked or raw. All parts of the parsley plant can be good for the whole digestive tract. It freshens breath, encourages appetite, relieves gas, and can even be used to treat irritable bowel disease. Some of the strongest medicinal properties of parsley are found in the seed, but you’re not likely to find any at the grocery store. If you grow your own parsley, try chomping on a few green seeds for a blast of intense parsley flavor. Like other seeds that stimulate digestion, parsley seed is high in essential oils. While the seed itself is safe, the distilled essential oil can be highly toxic when taken internally. There are many ways to make a parsley medicine. For a kidney or bladder infection, try fresh parsley juice. For kidney stones, Commission E recommends a strong tea made from the root. Stomach upset? Try a parsley seed tea. However, the best part about parsley is that you can also eat your medicine. Parsley is not only nutritious, it tastes good—clean and crisp with a little bitter bite. No wonder so many food cultures around the world feature at least one traditional parsley-based condiment. The French use persillade—a sauce of parsley, garlic, and lemon juice or vinegar. In Brazil, chopped parsley is combined with green onions to make the herb mix cheiro verde. Argentinians marinate raw meat in a parsley, garlic, and chili sauce called chimichurri, then spoon more on before serving. An Italian version called gremolata combines chopped parsley with garlic and lemon zest. The parsley-based salad tabbouleh comes from the Middle East—the birthplace of parsley cultivation. Tabbouleh combines parsley with a cooked grain, traditionally cracked wheat. The recipe below features an alternative grain, buckwheat, for a gluten-free version. In a medium-sized pan, bring water to a boil and add buckwheat kernels. Cook until tender (about 10 minutes). Drain and set aside. In a large bowl, combine parsley, mint, onion, and tomato. Add buckwheat, lemon juice, oil, salt and pepper, and mix thoroughly.